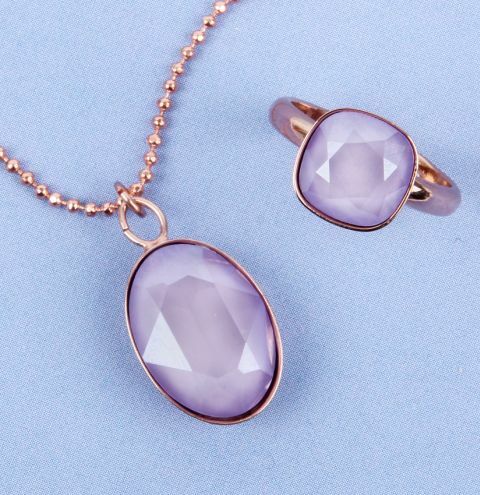 *WANDERLUST COLLECTION* Learn how to make a trending set of rose gold-coloured jewellery with NEW Swarovski crystal lilac in lacquer effect! This is a hugely popular colour for 2018 that combined beautifully with Pantone's Colour of the Year 'Ultra Violet'. To make the ring, apply a drop of Gem-Tac glue to the base, and carefully set the crystal into place. Allow to dry for up to 24 hours before wearing. To make the necklace, cut the chain to your required length. Attach the setting charm to the chain with a jumpring. Apply a drop of glue to the setting, place your crystal inside and allow to dry before wearing.